We anticipated that the Friday demonstrations would be large but we were surprised by their intensity. 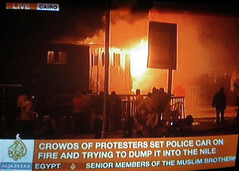 Linda had the television on and I heard "Cairo residents awakened to find the Internet and cellphone services cut off." Well, actually, I had awoken to "Why can't I Google anything?" I quickly discovered the lack of communications media. This was no surprise. Egypt runs on rumor and this cutoff had been making the rounds in rumor form for days. Fortunately, we have had access to satellite new networks throughout the crisis here. Both Al Jazeera International and CNN World News had excellent English language coverage. Both had cameras near the north end of Tahrir Square and perhaps the crowds were even playing to the cameras as much of the activity seemed centered around this area. The best coverage was supplied by Ben Wedeman on CNN who has spent many years in Cairo and could easily describe what the area along the Corniche would look like on a normal Friday versus the scenes being presented on this Friday. We stayed with the Television coverage Friday evening as a statement from President Mubarak was promised to begin at 7 p.m. He finally showed up a bit after midnight announcing that the government would resign and a new one appointed the next day. Land-line telephones were still working and we realized that the advice we had been given to get one might have been wise. We used the neighbor's land-line to call a friend who did advise us to restock the refrigerator the next morning. 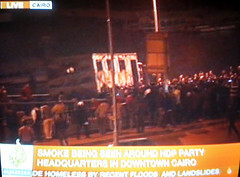 Saturday passed with coverage of Tahrir square the focus of news reports. One Al Jazeera camera was trained almost directly on the corner where we had spent much of Wednesday. Our friend who normally works in an office there was at home. By Saturday noon, most cellphone service was restored but there was still no Internet. With casualty counts and morgue shots showing up on Al Jazeera things were starting to look much worse. Saturday evening there were reports of looters and "citizens were advised to protect their own neighborhoods" since the police had withdrawn their presence. By midnight, local young men from the neighborhood had gathered in front of our building (and others nearby) building a small bonfire in the street. Later they gathered wood and stones to build a small barricade, narrowing the traffic to a single lane. They had at least one rifle which was occasionally fired into the air. (I should note that this is not unheard of. There has been rifle firing into the air following major football games that I've observed in the past) They also were also passing around a bottle. Hot tea, I presume! If you are uncomfortable sleeping with occasional gunfire taking place in the background, Cairo may not be the place for you right now. During the day on Saturday we ventured out to the local grocery store about two hundred yards up the street. I spotted an American woman walking in the opposite direction. It turns out that she also lives in our neighborhood. Her husband is Egyptian and has restricted her to the local neighborhood as we have done for ourselves. Ben Wedeman was absent from the CNN coverage on Saturday. He was reporting on Sunday that he had been looking after securing his family the previous day. He reported on the local "vigilante" force in his neighborhood who were taking steps to protect against looters. Some of the television reports showed people with clubs and swords. Wedeman mentioned his wife passing out baseball bats to others. I'm not sure just where the bats might be coming from. It appears that quite a few folks do have access to firearms as well. A friend tells us that there are many people that have a sporting rifle. Another friend reported being "terrified" at the sound of gunfire on Saturday night. It sounded to me a bit last night like the morning of opening day of hunting season in northwest Wisconsin. Sunday noon presented a bit more calm on television downtown as the military moved a larger presence into the area surrounding Tahrir Square. On the other hand, there were also reports that the United States has advised its citizens to consider leaving Egypt if at all possible. There are reports that there would be flights arranged to Europe beginning Monday. We are sitting tight at the moment. We had an appointment today (Sunday) with a local worker to measure for new windows on the North side of our apartment. Most people have much better quality double-glazing that shuts out the noise from the new elevated highway out front. Our worker arrived on time although our Bawaab took the unusual step of escorting him to our door. People are just being a bit more cautious about everything. The "new government" being appointed turns out to be some strong former army men taking up the roles of Vice President and Prime Minister. This doesn't appear to satisfy the demonstrators in any way. They seem to have one primary goal - Mubarak out. There is no doubt in my mind about what were the most surprising scenes of the revolution (and have no doubt, that is what is taking place!) The police are a very feared organization in Egypt. I joke a bit about the Tourist Police that are found throughout the country. They are usually seated on a chair looking pretty bored and sleepy in a subway passage or on a bridge. But they maintain peace and quiet with a ruthless brutality. Many stories are told of torture and beatings. These police transport trailers that serve as both officer transport and staging areas are worrisome to the average Egyptian. I mentioned them a few days ago. To see these trailers being rocked in an attempt to throw them off the bridge and to see them later in flames was the announcement that the revolution is on.